There have been sharp exchanges in the US House of Representatives at the start of a marathon debate on Iraq. Legislators will vote on Friday on a non-binding resolution opposing President George W Bush's decision to send extra troops. Democratic House Speaker Nancy Pelosi said the US public had lost faith in the president's strategy. Republican minority leader John Boehner said attempts to undermine US policy would embolden terrorists worldwide. The resolution was introduced on Monday. Each member will have five minutes to speak ahead of Friday's vote. This is the first full debate in the House since the Democrats took control of Congress in November. At the heart of the debate is the decision by President Bush to send an extra 21,500 US troops to try to restore stability to Iraq. Ms Pelosi said the US commitment in Iraq had "no end in sight" and there should be "no more blank cheques". "The American people have lost faith in President Bush's course of action in Iraq and they are demanding a new direction," she said. 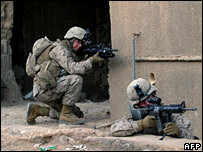 Iraq war veteran, Democrat Patrick Murphy, said: "Three years after I left Iraq, Americans are still running convoys up and down Ambush Alley and securing Iraqi street corners." But Republicans stoutly defended the new Bush strategy. Ted Poe, of Texas, said the debate was "political posturing of the worst kind". 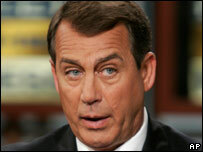 Mr Boehner accused the Democrats of trying to "cut off funds for troops in harm's way and leave Iraq in chaos". Democratic majority leader Steny Hoyer said there would be "no defunding". At the White House, spokesman Tony Snow said: "We do expect those who say they're going to support the troops to support them." The resolution states that the House "will continue to support and protect" troops in Iraq but that it "disapproves" of the troop increase. What do you make of this debate? Is Congress in tune with the American people? What message should it be sending on Iraq? The BBC World Service radio programme World Have Your Say will be discussing this topic at 1800GMT and using comments left here during the show. As a result comments will not appear on this page.